Hey there, fellow growers! Have I mentioned that I am so happy to be writing and discussing gardening again? In ways it feels like my destiny. I love it, absolutely love it, and often nerd out over soil and plant varieties and the thought balancing nature with my own hand as much as I can (though I think we all know the balance is often out of our own hands). Last year, I gave you a guide to planting your fall garden. It's easily one of our most downloaded freebies and basically walks you through the weeks that you should be either starting seeds indoors, direct sowing, and/or transplanting seedlings outside. It's a really useful tool, especially if you have no idea how to walk yourself through that process! Of course, we are now approaching the spring growing season. We are?! You ask. But it's only January 11th! For me, that's an estimated 7 weeks before I need to get my first seeds started. In mom years that feels like about the blink of an eye, you feel me? I can remember starting my first seeds last year. You soak your little packs overnight, fill in the trays, and BAM. You're putting them in the ground wondering where the past six to eight weeks went and how you even grew something from what was seemingly insignificant. It goes by quickly, and why sweat it when you can have a little bit of help in the process of planning? First thing's first, figure out when the last hard frost will be! This is always be a probable date, as it's never certain and calculated by looking at climate normality in years past. 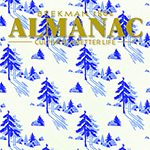 My favorite place to look this up is through the Old Farmer's Almanac. You can look in their publication for the year or simply online, but either way, I've found it to be a good source of information for planting dates and such. In fact, last year, I used their lunar planting calendar. Their theory is that by planting by the waxing and waning of the moon, you'll have a better production of plants overall. I didn't really think much of it, but I did have an amazingly productive year last year, so I will probably plant by the moon again. What do I have to lose, right?! If you're not wanting to purchase the publication then you can always use their First and Last Frost Dates Calendar on their website. I like this a little more because it looks directly at your zip code rather than the nearest large city. For me, that's near Williamsburg, Iowa and it appears that my last spring frost date is April 26th! According to their publication, I used Cedar Rapids, and the date was April 25th. Not too shabby! Once you have your last spring frost date, then it's simply counting back the weeks. This is the fun part! It can be completely unique or standard as you wish. My biggest tip: plant what you like to eat. Don't plant something just because you feel like you should or because your mother told you that's what she loves or because the internet told you to try a weird, new variety or superfood (though you could end up liking it!). Plant what you love to eat, and you will have a successful garden. Why? Because you'll be in there picking food for your meals instead of going to the grocery store! Spring plantings are the time to begin all of your warm season vegetables like tomatoes, peppers, squash, cucumbers, brassicas, peas, beans, chard, potatoes, and onions. I like to think of spring growing and fall plantings as... bread to the meat. You're substance vegetables are ready to harvest in late summer, and in the early spring and fall you'll be growing greens, roots, and hardier plants. Some seeds need to be started indoors before you can plant them outside! This allows you start plants early which means a faster maturing crop as well as protection from the elements. In my guide, which you can download by clicking the button at the end of this post or heading to our online shop, I help you figure out the best date to begin starting certain types of seeds. This is generally about 8 to 10 weeks before your last spring frost. For me, that makes it the last week of February. Boy, does that seem close! Starting seeds can be difficult for some, but it really only takes a little patience and knowing what to look out for. You can learn more about starting seeds in this blog post if you need some guidance! You're approaching the time to plant. When is that? If you started seeds, then they are ready to transfer to the ground once their true leaves have showed up. The first little leaves they sprout are called cotyledons and are part of the embryo, otherwise known as the "seed leaves." The second set of leaves that appear after this are the true leaves. If you think that your seedlings look too small and frail to transplant, you can always transplant individual seedlings to a larger container where their roots will have more room to grow - a seed starting tray does not give them much room to spread out! For the most part, you can just plant them directly into the soil. Again, you can refer to my downloadable guide to see which weeks I recommend transplanting! Want to plant by the moon with me? According to the Farmer's Almanac, it is a sworn practice that results in larger, tastier vegetables. That sounds good to me! The entire concept is that you plant flowers and vegetables that bear crops above ground during the waxing of the moon and plants that bear crops below ground during the waning of the moon. You can check out their lunar planting calendar on their website. It looks like we will be planting quite often in March and April in Iowa! It's going to be a fun year for us! We have almost 8,000 square feet of planting space, half of which we will be using to grow cut flowers. I am really excited for that! There are lots of new varieties that I will be trying this year. What are you hoping to grow? I would love to hear about your garden! Click the button below to grab my Spring Planting Guide, which tells you the weeks in which to plant before and after your last spring frost date. It's a general guide, so please look into your specific region and read the backs of your seed packets! They really do help quite a bit. Get The Spring Planting Guide! Have more questions about scheduling your garden? Be sure to check out our Monthly Homesteading Guides!